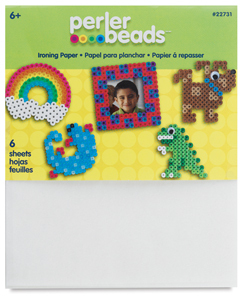 Perler Bead projects are easy and eye-catching! From colorful basic shapes to more elaborate designs this effortless craft offers children hours of creative fun and results in pieces they can display, admire, and exchange! Designed especially for use with Perler Beads and Pegboards, this ironing paper will protect your iron during the fusing process. The package includes six reusable sheets.